I have no idea who Henry Brooks Adams is, but the guy made a great point. 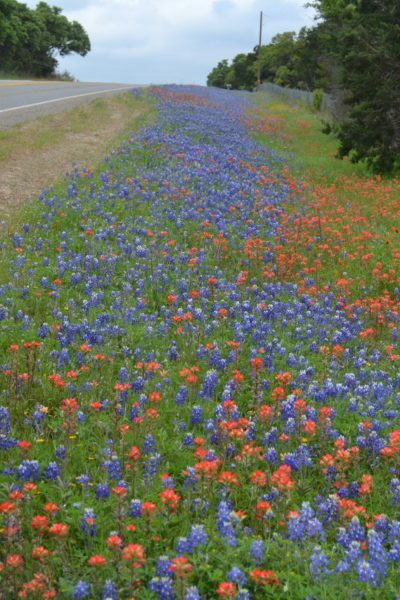 I stopped to take a few pictures of wildflowers between Llano and Fredericksburg, Texas. It’s been a beautiful spring this year. When I was in college, I had a lighted makeup mirror. . It had a border of bright lights and the mirror could be switched to a magnifier. All I can say now is “UGH” about the thought of magnification. Every little line, pore, and blemish—I can’t hide from what I see. My husband loves my eyes, but somehow blemishes and lines stand out more to me when I look in a magnifying mirror. The same is true with relationships. The more time we spend with someone, I can say with 100% certainty that we’ll see flaws and faults we didn’t notice at first. Just like looking in the mirror, we can’t miss imperfections. We can’t escape the reflection of truth. And sooner or later, lest we get smug and congratulate ourselves at what a wonderful friend we are, we end up showing own faults for our friends to see. So shouldn’t surprise us when our friends show us their faults, and we must head out to the cemetery that Mr. Adams speaks of. We must shoulder our shovel, drag our friend’s offending fault behind us, and start shoveling. As we dig, we must say, “I know this is my friend’s fault/flaw. Because they are my friend and I love them, I will bury this fault and won’t keep it with me. I choose not to hold this against them.” We are all works in progress, and our friends remind us of this without saying a word. Sometimes small offenses can pile up over time, and before we know it, we’re lugging a wheelbarrow full of them with us. One friend or another has misspoken or treated us carelessly, and we never make that trip to bury their fault. This can damage friendships over time, even small things. I also recently have been reminded that my own faults can irritate, or worse, injure my friends. But true friends are the ones who won’t hold our faults against us. Instead, they’ll simply hug us, pick up their shovel, and head for the graveyard of forgiveness where our faults are buried. Am I carrying reminders of my friend’s faults? Do I need to forgive my friend’s offenses or bury those irritations against me? Do I need to think more before I speak and/or act? Am I thinking of what I want, more than what is important to my friend? Do I need to ask forgiveness from my friend? Those of us who are married, can simply insert the word “spouse” above. Sometimes it is easier said than done! I’m thankful for the times my husband has buried my faults in our 21 years of marriage and I’ve certainly worked to practice burying his. These are all great questions to ask ourselves. Thanks for the reminder, Lynette. The wildflower photo is beautiful! Thanks for stopping by, Wemble, with your day opposite mine. I hope you have a great Tuesday! It is a lovely picture of forgiveness that you’ve painted. Your post reminds me of the latest one from Autumn Macarthur this month about commitment. I think there’s a whole lot of asking for forgiveness and forgiving when we’re committed to a relationship–with friends, spouses, and even at work I dare say. Especially at work! :) Thanks for stopping by, Priscila. Burying our friends’ faults sure beats parading them in public! Thanks for the reminder. Lynette, great post. I love those verses about forgiveness. I still have one of those magnifying makeup mirrors. I call it my “scary” mirror. Great post and much needed reminder! Love the picture of burying those faults and letting them go and not lugging them around. Thanks so much for sharing this!